IBM is a global technology and innovation company headquartered in Armonk, NY. It is the largest technology and consulting employer in the world, with approximately 427,000 employees serving clients in 170 countries. Utilizing its business consulting, technology and R&D expertise, IBM helps clients become "smarter" as the planet becomes more digitally interconnected. This includes working with organizations and governments to build systems that improve traffic congestion, availability of clean water, and the health and safety of populations. IBM Rational Integration Tester formerly known as Green Hat. It is a virtualization tool that works on scripting-free environment and being used for continuous integration in the software lifecycle. It is a part of rational test workbench and also used to create functional and performance tests for service-oriented architecture (SOA) messaging and business process integration projects. It is compatible with a number of enterprise messaging solutions. Tests are conducted by recording system behavior. Rational Integration Tester offers a cost effective test environments which enable customers to test earlier and frequently throughout the development lifecycle. IBM® Rational® Performance Tester is a performance testing solution that validates the scalability of web and server applications. Rational Performance Tester identifies the presence and cause of system performance bottlenecks and reduces load testing complexity. Rational Performance Tester helps to quickly execute performance tests that analyze the impact of load on the applications. 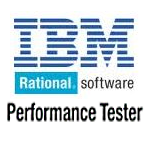 IBM Rational Functional Tester is an automated functional testing and regression testing tool. This software provides automated testing capabilities for functional, regression, GUI, and data-driven testing. Rational Function Tester supports a range of applications, such as web-based, .Net, Java, Siebel, SAP, terminal emulator-based applications, PowerBuilder, Ajax, Adobe Flex, Dojo Toolkit, GEF, Adobe PDF documents, zSeries, iSeries, and pSeries.